The York Press reported yesterday that a wall of the old St Leonard’s Hospital building, between the Museum Gardens and Library Square, has been covered with graffiti, in the form of angry scribblings and daubings. I can’t understand why someone would want deface lovely old limestone of great historical significance. ‘Graffiti’ does of course take many forms. We do have some accomplished graffiti/street art, as noted in an article this week at www.oneandother.com, discussing the artwork/graffiti alongside Clifton Bingo (former cinema). As the piece mentions, it has been repainted several times. The artist, Keith Hopewell (aka Part 2, more recently Part2ism) is apparently a friend of the family who own the building. The work isn’t the kind of thing created in ten minutes by someone dashing in with a spray can under cover of darkness. The previous work, included on this page from 2004, has of course been obliterated by the current painting. When I included it originally, most people didn’t have a broadband connection, so photos had to be kept to a small and manageable size. It deserves a second, bigger look. This image – just one of six panels – can be enlarged. Other images are in a set on flickr.com. 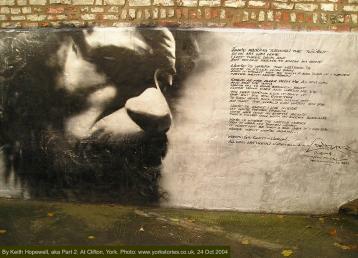 The text included is ‘Home is where the hatred is’ by Gil Scott-Heron. Sharing nothing much with the above, apart from the fact that they’re both outdoors, is the random and irritating type of graffiti known as ‘tagging’. Some efforts to obliterate it seem rather pointless, and actually make things look worse. 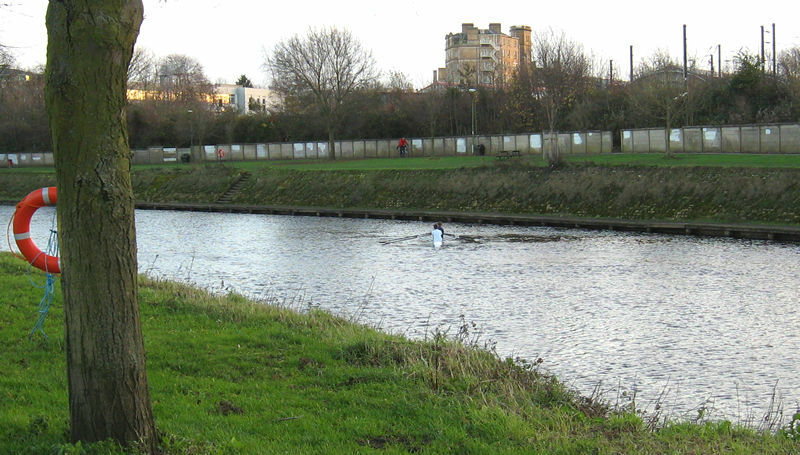 I’m glad to have the opportunity to include this photo, taken some months ago, of the grubby concrete wall which runs alongside the river between Scarborough Bridge and the Leeman Road area. I was on the other side of the river, and wouldn’t normally notice the wall, but my attention was drawn to these large blocks of paint – an attempt to cover up graffiti. Doesn’t really work, does it. Of course, you can make your mark by scratching into a surface as well as applying something to it, and this too is a well-established and indeed ancient form of ‘graffiti’. A modern take on it – an inspired and inventive approach – is ‘grime writing’, discussed in Dr. Dirt: Street artist scrubs images into the urban landscape. Amusing to read about bemused authorities trying to work out if making patterns in urban dirt is a crime. 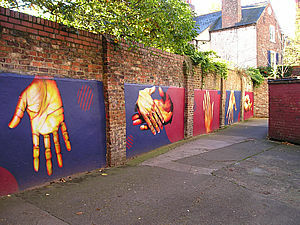 Graffiti branded ‘an attack on York’s heritage’ – York Press, 13 April 2012. Depressing isn’t it. And an even more inspiring idea – though you have to be patient: grow your own graffiti. By Lisa @YorkStories • 14 April 2012 Art and graffiti To link to this page's proper location please use the > permalink.